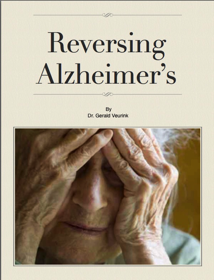 The “Reversing Alzheimer’s” eBook by Dr. Gerald Veurink contains the most comprehensive treatment method currently available. It may be Freely downloaded and shared with others. To read this book on an iPad you need to have installed iBooks 3 or later. Please click on the link to the iTunes Store or to Amazon (Sorry 99cents for the Kindle format) below. Other formats including PDF and Text file is also available (Please see below).